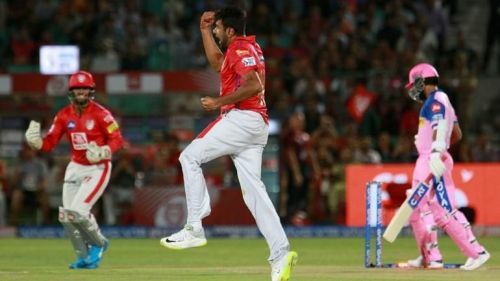 Kings XI Punjab registered their fifth win of the tournament beating Rajasthan Royals by 12 runs in the 32nd match of IPL 2019 played at PCA Stadium, Mohali on Tuesday. Rajasthan Royals captain Ajinkya Rahane won the toss and decided to field first. Chris Gayle played with positive intent, putting pressure on the Rajasthan Royals bowlers while KL Rahul took time to settle. Jofra Archer got the breakthrough by dismissing Gayle for 30 off 22 balls. At the end of six overs, Kings XI Punjab were 38 for 1. After the power play overs, Mayank Agarwal played some big strokes before Ish Sodhi dismissed him for 26 off 12 balls. Rahul and David Miller then took some time to settle before smashing the Rajasthan Royals bowlers all over the park. Rahul reached his fifty off 45 balls before Jaydev Unadkat got the big breakthrough by dismissing for 52. Rahul and Miller had added 85 runs for the 3rd wicket. Archer then bowled a brilliant 19th over, picking the wickets of Nicholas Pooran and Mandeep Singh. Ravichandran Ashwin played a cameo, scoring 17 off 6 balls which helped Kings XI Punjab post a competitive total of 182 for 6. For Rajasthan Royals, Archer took 3 for 15 in 4 overs. Chasing the target of 183 runs, Jos Buttler and Rahul Tripathi gave the team a flying start and put pressure on the Kings XI Punjab bowlers. Arshdeep Singh then got his maiden T20 wicket by dismissing Buttler for 23 off 17 balls. Tripathi and Sanju Samson steadied the Rajasthan Royals innings, taking singles and hitting occasional boundaries. At the end of six overs, they were 54 for 1. After the power play overs, Tripathi and Samson continued to play aggressively to keep the required run rate in check. Ashwin then struck, dismissing Samson for 27. Samson and Tripathi had added 59 runs for the 2nd wicket. Kings XI Punjab restricted the run flow after that and did not allow RR batsmen to score easily. Tripathi reached his fifty off 44 balls and was soon dismissed by Ashwin. Ashton Turner, making his IPL debut, was dismissed for 0. Stuart Binny played a blinder of an innings remaining not out on 33 off 11 balls, but could not help Rajasthan Royals cross the line. With 23 runs required off the last over, Mohammed Shami gave just 11 runs. Kings XI Punjab won the match by 12 runs. Brief scores: KXIP 182 for 6 in 20 overs (KL Rahul 52, Miller 27, Gayle 30, Archer 3/15) beat RR 170 for 7 in 20 overs (Rahul Tripathi 50, Stuart Binny 33*, R Ashwin 2/24, Shami 2/46) by 12 runs. Follow Sportskeeda for all the updates on IPL points table 2019, schedule, news, live scores, orange cap, purple cap and fantasy tips.